To investigate the predictive factors of visual acuity (VA) after cataract surgery in patients with retinitis pigmentosa (RP). Retrospective, observational study. The authors reviewed a consecutive series of 70 patients (109 eyes) with RP who underwent cataract surgery. The changes in best-corrected visual acuity (BCVA) before and 3 months after surgery were measured. 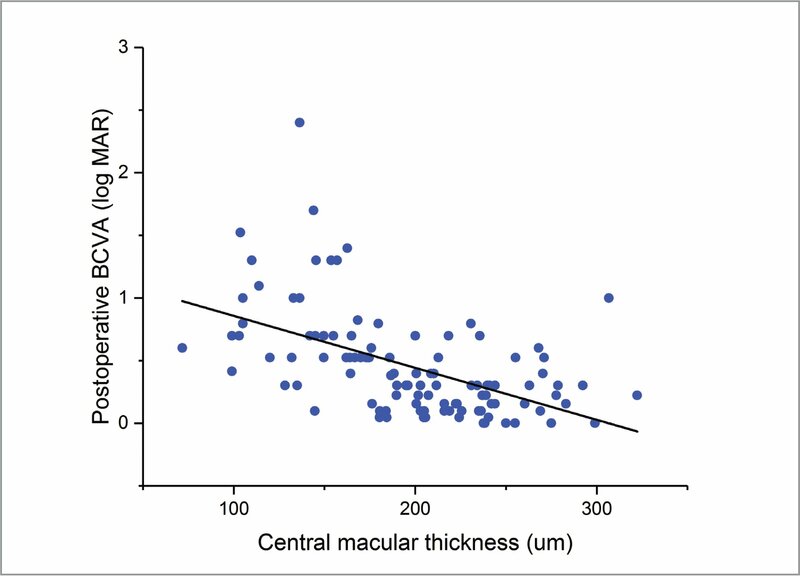 The relationship between preoperative ellipsoid zone (EZ) conditions, external limiting membrane (ELM) conditions, central macular thickness (CMT), and postoperative BCVA were investigated. 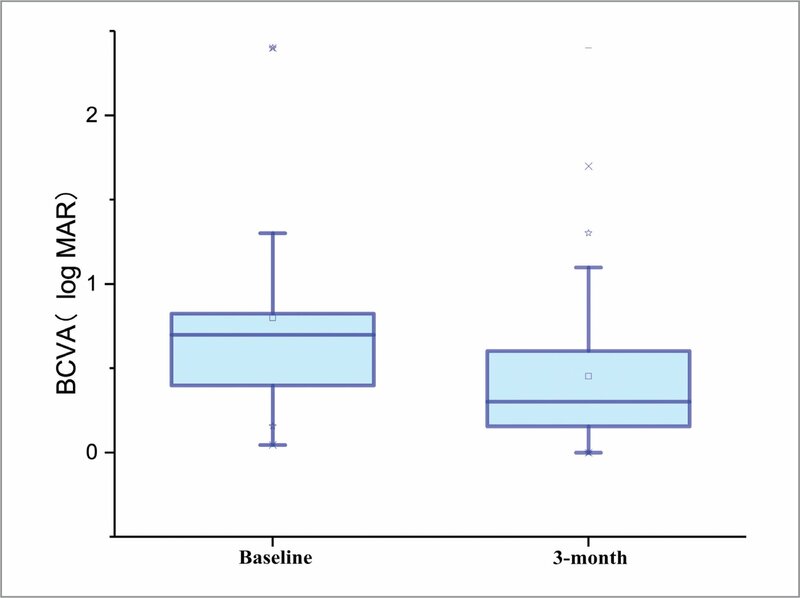 The mean BCVA was significantly improved after cataract surgery from 0.80 to 0.45 (P < .001). However, final BCVA did not improve in 57 eyes (52.3%). 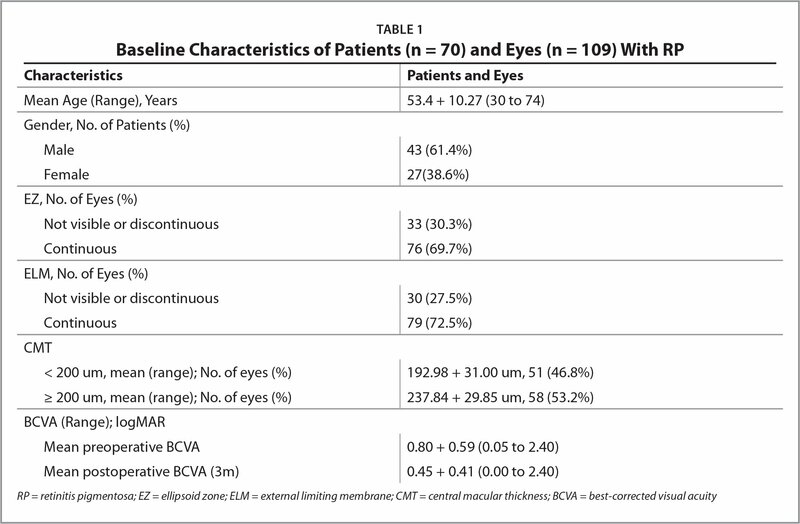 The mean postoperative BCVA was significantly better in eyes with an intact ELM than those without (P < .001), in eyes with an intact EZ than those without (P < .001), and in eyes with relatively normal CMT (≥ 200 μm) than those with decreased CMT (< 200 μm) (P < .001). In multiple linear regression analysis, preoperative logMAR VA (P < .001), ELM integrity (P < .001), and CMT (P = .017) remained the only three variables that were associated significiantly with postoperative BCVA (R2 = 0.753; P < .001). Postoperative BCVA in approximately half of the eyes was improved after cataract surgery in patients with RP. The preoperative BCVA and the status of ELM and CMT are important parameters to predict postoperative VA.
Retinitis pigmentosa (RP) is an inherited retinal disease characterized by progressive loss of the photoreceptors and eventual central visual loss.1 To date, no effective treatment has been discovered to suspend or reverse the degeneration of the photoreceptors; yet, there are different methods to manage the complications of the disease. Cataract is the most common complication of all types of RP. Incidence was reported to be as high as approximately 45%.2 Posterior subcapsular cataract, the most common category, would result in the substantial visual acuity (VA) loss because of direct obscuration of their remaining island of central vision in RP.3 Thus, phacoemulsification with implantation of intraocular lens (IOL) is generally thought necessary for this patient group. However, it is not easy to predict the visual outcomes in consideration of pathological changes in both retina and crystalline lens. Prior to surgery, it is normally difficult to determine whether visual function reduction is due to cataract or the photoreceptor degeneration in RP. Presently, optical coherence tomography (OCT) has gained wide acceptance in evaluating the retinal structure in vivo.4 OCT emerged as an essential preoperative test in predicting postoperative visual outcomes and risks of complications for patients with age-related cataracts.5 The relationship between the outer retinal disruption on OCT and the outcome of cataract surgery in RP has remained controversial. For example, Yoshida et al.6 found that patients with RP with normal ellipsoid zone (EZ) had better best-corrected VA (BCVA) than those with abnormal EZ. 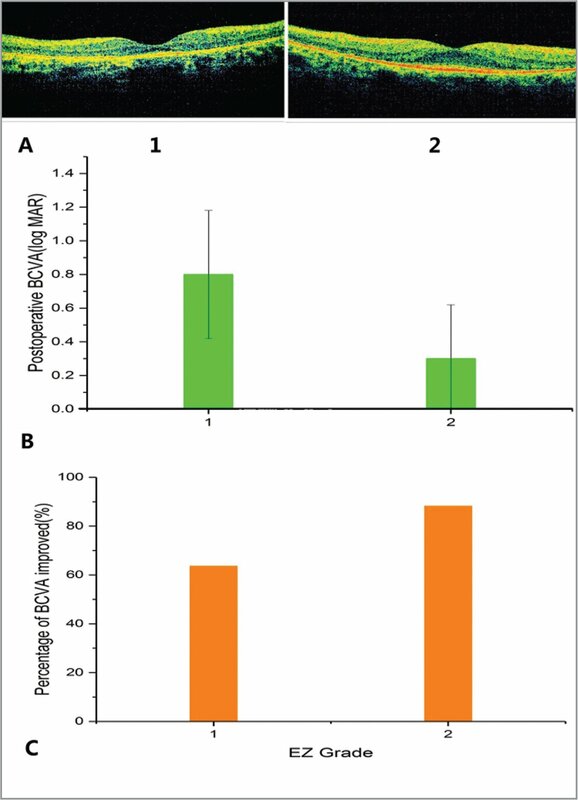 However, Battaglia Parodi et al.7 demonstrated that inner segment / outer segment junction (now named EZ) was not associated with the decrease of BCVA after multivariate regression analysis. Moreover, the relationship between the external limiting membrane (ELM) and outcome remains unknown. A retrospective, observational clinical study was designed on patients with RP who underwent cataract surgery to present more detailed analysis on structural change and its effect on visual outcome. Predictive factors affecting postoperative VA were evaluated in this study. This retrospective case study was conducted on 109 eyes of 70 consecutive patients with RP (43 men and 27 women) who underwent cataract surgery at the Eye Hospital of Wenzhou Medical University (WMU) between October 2010 and January 2016. The age of the patients ranged from 30 years to 74 years (mean: 53.4 years ± 10.3 years). Written informed consent was obtained from all participants, and the study was approved by the institutional review board. The diagnosis of RP was made based on clinical history and physical examination. Any patients with history of vitreoretinal surgery or factors that preclude OCT examinations, including macular edema, vitreomacular traction, glaucoma, high myopia, and dense cataracts, were excluded from this study. Cataract surgeries were performed by experienced ophthalmologists at the Eye Hospital of WMU who carried out standard phacoemulsification and implantation of IOLs in all patients. All patients had a complete ophthalmic examination including spectral-domain OCT (3D OCT-2000; Topcon, Tokyo, Japan), direct ophthalmoscopy, and BCVA measurements before the surgery. BCVA was measured monocularly at a test distance of 5 months before and 3 months after cataract surgery and expressed in decimal form but stated in logMAR format during statistical analysis. Paired t-tests were used to determine the significance of the changes in the BCVA. The postoperative BCVA in each subgroup was compared using data analyzed by independent-sample t-test. A multiple linear regression analysis was performed using the preoperative BCVA, status of EZ, ELM, and CMT grade as variables to evaluate the impact on postoperative visual prognosis. P value of less than .05 was considered statistically significant. A total of 109 eyes from 70 subjects (43 men and 27 women) were examined. The age range was 30 years to 74 years, with a mean of 53.4 years. Baseline characteristics of patients with RP are shown in Table 1. Changes in preoperative and postoperative BCVA are shown in Figure 1. The mean preoperative BCVA was 0.80 ± 0.59 (range: 0.05 to 2.40). Although it seemed that the postoperative BCVA was significantly improved from the preoperative BCVA (P < .001, paired sample test), the postoperative BCVA was improved (> 0.3 log MAR) in only 52 eyes (47.7%) and was unchanged in 57 eyes (52.3%). Neither of the eyes' postoperative BCVAs were worsened from the baseline. A significant positive correlation was found between preoperative and postoperative BCVA (R = 0.768; P < .001). As shown in Figure 2, a standard OCT image was chosen to represent each of the two ELM groups. The ELM was invisible or abnormal (discontinuous ELM group) in 30 eyes (27.5%). In this group, postoperative BCVA was improved in 18 eyes (60.0%). Meanwhile, a normal ELM (intact ELM group) was identified in 79 eyes (72.5%). In this group, postoperative BCVA was improved in 70 eyes (88.6%) (X2 = 11.440; P = .001). The mean postoperative BCVA was 0.85 ± 0.48 in the discontinuous ELM group and 0.30 ± 0.26 in the intact ELM group. 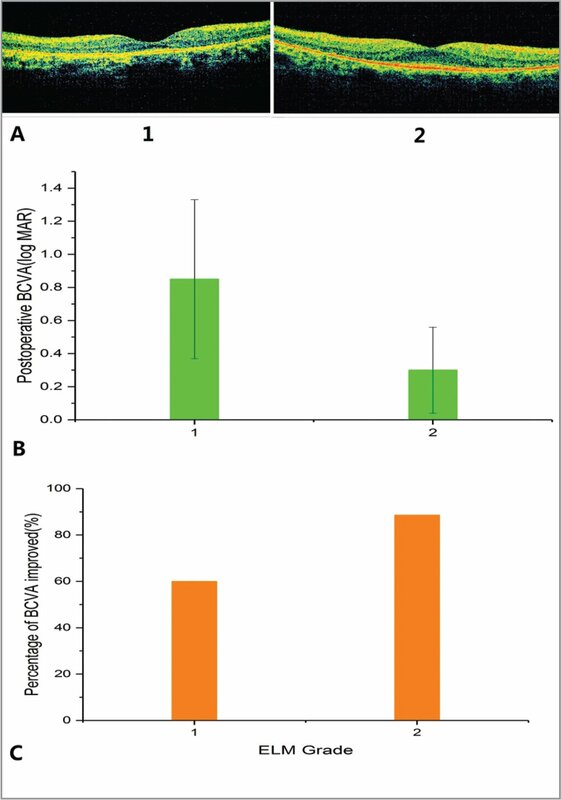 A significant difference existed between the mean postoperative BCVA of the two groups (P < .001, independent-samples t-test). As illustrated in Figure 3, a standard OCT image was chosen to represent each of the two EZ groups. The EZ was invisible or abnormal (discontinuous EZ group) in 33 eyes (30.3%). In this group, the postoperative BCVA was improved in 21 eyes (63.6%). Further, a normal EZ (intact EZ group) was identified in 76 eyes (69.7%). In this group, the postoperative BCVA was improved in 67 eyes (88.2%) (X2 = 8.895; P = .003). The mean postoperative BCVA was 0.80 ± 0.38 in discontinuous EZ group and 0.30 ± 0.32 in the intact ELM group. There was also a significant difference in the mean postoperative BCVA between the two groups (P < .001, independent-samples t-test). There were 51 eyes (46.8%) in group 1 (CMT, < 200 μm), and 58 eyes (53.2%) in group 2 (CMT, ≥ 200 μm). The mean CMT was 192.98 μm ± 31.00 μm in group 1 and 237.84 μm ± 29.85 μm in group 2. The postoperative BCVA was significantly better in group 2 than in group 1 (P < .001, independent-samples t-test). Moreover, the correlation between the CMT and the postoperative BCVA was significant (r= −0.526; P < .0001) (Figure 4). A multiple linear regression analysis was performed using the preoperative logMAR VA, status of EZ, status of ELM, and CMT group as variables to evaluate the impact on postoperative VA (R2 = 0.753; P < .001). The factors that were found to be significantly associated with postoperative BCVA at 3 months were preoperative log MAR VA (P < .001), ELM integrity (P < .001), and CMT group (P = .017). The status of EZ was not significantly correlated (P > .05) (Table 2). The incidence of cataract, one of the most common complications of RP, was reported to be present in approximately 45% of the patients.2 It has been reported that cataracts in patients with RP develop faster than simple age-related cataracts. In the present study, the mean age at surgery in patients with RP is 53.4 years ± 10.27 years, whereas the mean age at surgery in those with age-related cataracts was reported to range from 72 years old to 74 years old.8 With the presence of RP, relatively minor lens opacity may cause disproportionate functional symptoms. Cataract surgery led to an increase of contrast and helped those with RP gain VA. In the present study, we investigated the factors affecting postoperative VA and assessed their predictive value in patients with RP. In the present study, we found a significant improvement in the mean BCVA after surgery, and no one had a worsening VA. However, only approximately half of the eyes (47.7%) were improved after surgery. This is similar to previous studies,3,6,8,9 which showed that the mean BCVA was significantly improved after surgery: postoperative BCVA was improved in 42% to 87.5% eyes but worsened in none to 2.5% eyes. This illustrates that only a negligibly small percentage of patients with RP have worsened VA after cataract surgery. Additionally, some of the studies pointed out a subjective improvement in function after surgery even when VA remains unchanged. This indicates that the combination of various methods in measuring visual function may better assess visual outcome post-surgery in patients with RP. All the above suggests that cataract surgery was beneficial with respect to VA in most patients with RP. Thus, we recommend cataract surgery as an available choice for patients with RP and cataract. The EZ is the second hyperreflective band on OCT that corresponds with the anatomical location of the ellipsoid portion of the photoreceptors inner segment.10 In many retinal diseases, including macular hole11–12 and retinal detachment,13 the relationship between the presence of the EZ line and preserved photoreceptor function has been reported. As the early histopathological changes in eyes of patients with RP were a shortening or distortion of the rod and cone photoreceptor outer segments, monitoring the integrity of EZ using OCT can be a valuable indicator to evaluate the structural changes of the outer retina in patients with RP. Accumulative evidence shows that the integrity of EZ is strongly associated with better visual function, brighter fundal autofluorescent parafoveolar density, and higher retinal sensitivity in disease of the outer retina including RP.14–18 Chhablani et al.14 described that the EZ length is significantly correlated with the VA and that the presence of the EZ was associated with better VA in patients with RP. Battu et al.15 also reported that the length of the EZ line correlated with the retinal sensitivity in patients with RP. In the present study, the patients with an intact EZ showed a significantly better VA than those without an intact EZ, representing a potential indicator of retinal function. The integrity of the ELM line, the discrete hyperreflective band at the outermost border of the outer nuclear layer, was reported to be another potential indicator of retinal function. A relationship between an intact ELM and good visual function has been noted in different retinal diseases, including degenerative eye diseases such as age-related macular degeneration, macular hole, and epiretinal membrane.12,19–22 Iacono et al.20 investigated the relationship between ELM integrity and visual acuity in patients with diabetic macular edema. The mean baseline BCVA was significantly better in eyes with an intact ELM. Our results also showed that patients with an intact ELM line exhibited a remarkably better VA than those without, which is consistent with previous studies.7 In other words, the absence of ELM layers would be associated with a decrease in BCVA in patients with RP. In RP, it is possible that the ELM could be a marker of photoreceptor integrity, which might play an important role in the reorganization of the photoreceptor microstructure.19 To our knowledge, this is the first report on the relationship between the ELM line and VA in patients with RP after cataract surgery. By using multiple linear regression analysis, we also explored which of the preoperative variables were significant to be predictors of postoperative visual outcome. Among all measurements, preoperative logMAR VA, ELM integrity, and CMT group were essential predictors of BCVA at 3 months. EZ integrity was not significantly associated. However, the status of EZ was individually correlated with postoperative BCVA in the present study, as expected from some previous reports. The layer that is found to contribute more to VA differs from study to study. One reason for this variation may be the deficit order of the layers. Hagiwara et al.29 found that in all subject eyes with RP, the length was the longest in the ELM, followed by the EZ, which suggests that shortening of the ELM is associated with the EZ and that retinal layer may become disorganized first at the EZ line and then the ELM line. This hypothesis was also supported by Liu et al.,28 who concluded that the deficit of the EZ preceded that of the ELM in RP. This indicated that the significance of the association between preoperative retinal layer status and VA may depend on the timing of the measurement. In conclusion, our study showed that mean postoperative BCVA was significantly improved from preoperative BCVA in approximately half of the eyes after cataract surgery in patients with RP. The preoperative BCVA, the status of ELM, and CMT grade may be important in predicting the BCVA after cataract surgery. Auffarth GU, Tetz MR, Krastel H, Blankenagel A, Völcker HE. Incidence and types of cataracts in patients with retinitis pigmentosa. Invest Ophthalmol Vis Sci. 1996;37(3):642–646. From The School of Ophthalmology and Optometry, Eye Hospital, Wenzhou Medical College, Wenzhou, Zhejiang, China (JM, YC, JT, MW, PW, YZ, LS); and Zhongshan Ophthalmic Center, Sun Yat-sen University, Guangzhou, Guangdong, China (DF). Financial support for this study was provided by the National Science and Technology Major Project of the Ministry of Science and Technology of China (2014ZX09303301); the Science and Technology Department of Major Scientific and Technological Projects of Major Social Development Projects of Zhejiang Province (2013C03048-3); the Medical and Health Platform Project of Zhejiang Province (2016RCB012); and the Medical Key Subject of Zhejiang Province (2016CXXK2). The sponsor or funding organization had no role in the design or conduct of this research. Address correspondence to Lijun Shen, MD, Retina Center, Eye Hospital of Wenzhou Medical University, 618 Feng-Qi East Road, Hangzhou, Zhejiang, China; email: slj@mail.eye.ac.cn.